Remark is a Dreamweaver extension. It allows its users to emphasize certains words or phrases inside a webpage. Shown as a floating window which can be moved or closed in order not to interfere with reading of the page. This window will appear when you pass the mouse over the word or phrase that is being emphasized. Text Sample: Roll the mouse over this text to see a sample. You can find more about in our Remarks - FAQ. Remark is distibuted as a Dreamweaver extension, in a file named HDWRemark.mxp. It can be used with Dreamweaver MX or later versions (including MX 2004, DW 8, DW CS3, DW CS4, DW CS5, DW CS6, DW CC, ...). After installation, the component can be accessed through the menu option Insert > Hot Dreamweaver > Insert Remark or Insertbar > Common > Insert Remark. To insert Remark in a webpage you need to define the website you are working on, and save the page where Remark will be inserted. Select the phrase or word to emphasize and select the option Insert Remark, in the menu or in the Insertbar as explained under "Installation". 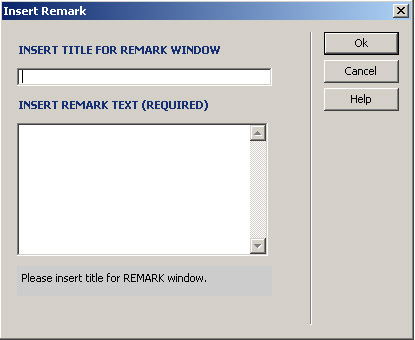 "Insert Title for Remark Window" is the title of the window that will be shown floating over the webpage when you pass the mouse over the phrase or word that needs to be emphasized. "Insert Remark Text" is the definition or the additional text to the word or phrase to be emphasized and is shown as the content of the floating window. When a remark is inserted in a webpage, a structure of directories is automatically generated, which is necessary for the correct functioning of this extension. The directories created, as well as their content, must be published along with the webpage where Remark was inserted, onto the server that hosts your website.